Members of Shir Rhythm love to perform for audiences of all ages. We are a multi-generational, diverse group of singers and we all have one thing in common: we love to sing, harmonize, and have fun! George Aronson started his music career leading campfire singalongs with his guitar in the early 1970s back when everyone had the same repertoire. His favorite musical styles include acoustic American and Israeli folk; ragtime, jazz and American Songbook tunes; Jewish music from the liturgy and from secular sources; world music; bluegrass and Jewgrass; and just about everything else, with the possible exception of rock music that got popular after he stopped listening to FM radio in the mid-1980s through the early 2000s (when he started learning songs from his kids). He is new to the world of acapella music, although he helps tweak and polish Shir Rhythm’s song arrangements. George enjoys improvisational harmony, tri-tone substitution, and singing dozens of melodies to Dror Yikra and other traditional Shabbat songs. Leah Bieler took up a cappella because she always has a song in her head, and this seemed to be as a way as any to vary the tunes. Also, rehearsals are a solid way to get a break from parenting four kids. The highlights of her singing career include performing as Leading Player in Pippin senior year of high school, helping people to forget they are fasting on Yom Kippur, and a whole mess of lullabies. Jackie Chados is a barrel of nonstop energy. When not singing with Shir Rhythm, she can be found Israeli Dancing or celebrating a simcha with her four beautiful daughters. Jackie always has a smile on her face and a pep in her step. Lisa Einstein (Business Manager) wears a multitude of different hats; all sparkly and ridiculous of course. Whether she is at home with her two young kids, Sophie and Theo, walking Maya the dog with her husband Evan, running the marketing world or paddle boarding on Lake Massapoag; Lisa’s energy never seems to wane. With a talent for creating amazing group choreography and fitting 16 people in her SUV for carpool karaoke, Lisa takes her job as Business Manager of Shir Rhythm seriously. When not on stage as an alto with jazz hands, she can also be spotted on Deal or No Deal on NBC, Let’s Ask America or the Match Game on ABC. Lisa is proud to have founded this a cappella group with her co-star in life, Heidi, and looks forward to creating more amazing music and memories together. Debra Hassenfeld Getz (Music Director) loves music. Ever since she was a baby, joyful melodies have warmed her heart and soul, and music techniques have guided her personal journey. Debra is a vocalist, pianist and guitarist. She is especially happy while singing harmony with her family and friends. Even her Curly-Coated Retrievers love to sing! 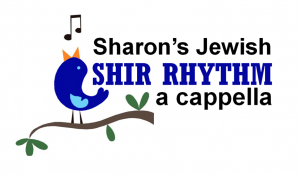 Debra is extremely proud of the accomplishments of her Shir Rhythm family, and she loves making music with her amazing SR friends! Mark Grossmann began his musical career singing Christmas carols in 9th grade choir. Musical theater followed with performances of Anything Goes, the Wizard of Oz, and Wildcat, where he sang in the chorus. After a long hiatus, Mark was again bitten by the music bug while transporting his then high school son from one award winning A cappella performance to another. After much coaxing by family and friends, and at the behest of one of the music directors, Mark auditioned for Shir Rhythm as a Bass. To his surprise, they liked his audition and he has been singing with the group for over two years. Mark is proud to sing with such a diverse and talented group. Mark is married to the very tolerant Lisa and the have two arty offspring. Mark received the thrill of a lifetime as Shir Rhythm sang the national anthem at Fenway Park! Heidi Kassner (President) can often be found upside down in downward dog position or playing with crystals. She is the President and Resident Witch Doctor of the group; taking care of all things Shir Rhythm and shear madness. When not doing yoga or singing, she can be found with her two children, Talia and Ari, at a Phish show with her husband Jon, out in nature or teaching social work at a University. Heidi is so thankful to be a part of this amazing group of singers and proud to have helped found it with her other half, Lisa and lead the way. Nadine Mende was born and raised in Paris, France where she loved singing and dancing. She had never heard of this strange way of singing – A Capella – until she moved to the US. Now she happily blares her “dim dim dot dot oo’s” with her fellow altos. In her spare time, she enjoys photography and practices dentistry on her unsuspecting patients. John Mercer practices law as an in-house attorney during the day and can be found on the sports fields with his three boys on the weekends. Adam Shain works for the wonderful world of Google, allowing us to use the world wide web to search for random facts and statistics anytime of day and night. When not googling, he is busy chasing around his four young children. When Adam is not singing with Shir Rhythm, he can be found singing karaoke at a local watering hole. Andrea Simonson has been singing ever since she was a little teapot, short and stout. She sings when she hikes. She sings when she bikes. She sings when she runs and even when she swims. She loves singing alto with Shir Rhythm. Valerie Sussman (Music Director) is an attorney by day, soprano by night. She enjoys wearing Shir Rhythm leggings and/or 80s attire in her free time. Val lives with her husband, her two kids, Quincy and Dahlia, who are ready to form the next generation of Shir Rhythm singers, and her dog, Tesla, who occasionally assists with vocal percussion. Dan Tarlin is a clinical social worker and Baritone. He sang a cappella in high school in the early 1980s before the invention of the beat box, when it was called “barbershop”, and is thrilled to be doing it again. He is the proud father of three sons and a recent empty-nester, looking forward to couples time on Lake Massapoag with his wife, Lora and their newest family member, Terrier-Beagle mix Roscoe. Abi Winter is a transplant to the area, hailing from NY. She joins our tenor section as the best dressed, always lookin snazzy and ready with her jazz hands. When not singing, Abi can be found travelling with her fiance Larissa or playing with their dog, Golda. Ilan Grossmann (Beat boxer) When Val’s dog Tesla can’t make a show, Ilan fills in as the alternate vocal percussionist. Ilan and Tesla are very close and don’t mind sharing this responsibility. In addition, to his vocal percussion duties, Ilan is also one of two music directors for Shir Rhythm. In Ilan’s spare time, however rare it might be, he tries desperately hard to do absolutely nothing and often fails. Ilan can usually be found somewhere in MA on some theater or sound gig but can be easily summoned by repeating his name thrice…or texting him. Texting usually works.